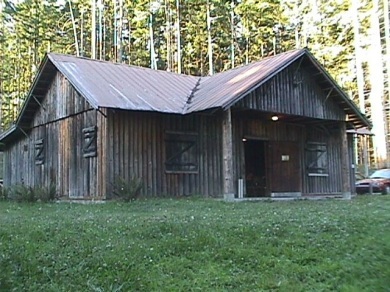 The Issaquah Sportsmen’s Club clubhouse was built during the great depression (1937), using funding from the Works Progress Administration (WPA). The clubhouse has been continuously used by the Issaquah Sportsman’s Club, with many activities open to the public. The Issaquah Alps Trails Club was founded at the clubhouse in 1979, and the Boy Scouts utilize the facility for troop meetings and trainings. In 1997, the clubhouse became a King County Landmark, and in 1998, it was listed in the National Register of Historic Places. The present-day photograph, shown above, was taken over the fence which surrounds the facility. Locked gates prevent approach of the building by non-members when it is not open for an event. Issaquah Sportsmen’s Club, 1940. Photo courtesy of the Washington State Archives. The club we know today as “The Issaquah Sportsmen’s Club” was originally formed in 1921. Some of its early names were the Issaquah Rod & Gun Club, the Issaquah Sportsman’s Association, and the Issaquah Gun Club. The club leased 1000 acres of prime bottom land along Issaquah Creek near the present location of Newport Way, to set aside for bird hunting. This parcel also included a small shotgun range. The Club’s membership lists read as a “Who’s Who” of Issaquah, including mayors, business leaders, members of pioneer families, and other prominent citizens, as well as mill workers and farmers. In the late 1920’s and early 1930’s, members became increasingly involved in fisheries conservation projects. In 1927, the Issaquah Club joined with sportsmen’s clubs in Bothell and Redmond to “lobby” county officials to open Lake Sammamish to year-around recreational fishing, to remove detrimental fish traps from tributary creeks, including Issaquah and Bear Creeks, and to restrict fishing on tributary creeks between November and April each year, to allow fish to spawn successfully. All three of these goals were achieved, and in 1933 the Issaquah Rod and Gun Club reorganized as the Issaquah Sportsman’s Club, to serve as a local volunteer group to assist with state-sponsored projects such as the planting of silver trout (the famed “ancient” kokane) in local streams. Following the establishment of the State Game Commission in 1935, local sportsmen’s associations also acted as advisory groups to the state in the regulation of local seasons, catch limits, and other conservation measures. As dairy farms surrounded the club’s shooting range and hunting land along the Issaquah Creek in the late 1920’s, the club purchased its own parcel of 10.7 acres at the foot of Tiger Mountain. In 1937, the Issaquah Sportsmen’s Club officially incorporated as a non-profit corporation, with the goals of promoting good sportsmanship and observance of state game laws, to work for protection and propagation of game and game fish, to promote recreational opportunities for members, and to construct a social clubhouse and other facilities for the enjoyment of members. The club immediately achieved its goal of having a “social clubhouse.” At the time, the federal government was funding projects through the Works Project Administration to boost the economy and put people to work. 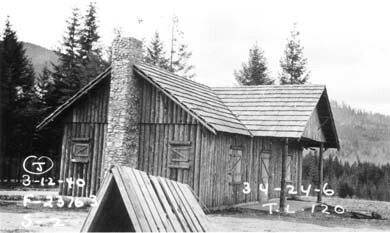 Since all WPA projects had to be public, the club donated some land to the City of Issaquah, which in-turn constructed the clubhouse with WPA funds and leased the building back to the club ‘in perpetuity.’ Other WPA projects in Issaquah included the State Salmon Hatchery and Gibson Hall. The Issaquah Sportsmen’s Club is located on a level graded site which drops off in a dense, young fir forest to the west. The façade faces south. The building was constructed on a site approximately 200 yards south of the current location, and was moved to the current site in 1993 to facilitate redevelopment of the original site for playfields. The one-story clubhouse building is built in a vernacular rustic style. The use of inexpensive and locally-available lumber for the clubhouse construction is reflected in the vertical half-log cladding and the peeled logs that support the eaves and porch roof and compose the window and door trim. The building was constructed in two phases–an original rectangular hall with a side gable roof and a rear shed-roof addition which extends the full width of the building. The addition was built in the late 1940’s, to provide restrooms and utility rooms. When the building was relocated, the addition was rebuilt, reusing the original log siding. The overall building dimensions are 40′ x 32’4″. The original section of the building has a side gable roof. The building is constructed of vertical half-logs averaging about 8″ in width. The logs are staggered, with the flat face turned into the wall. This wall system is structural. A standing-seam metal roof covers the entire building. The main section was originally covered in hand-split shakes, which remain under the metal roof. A 21′ wide front porch with a prominent projecting gable roof dominates the façade. The original 4′ wide door remains centered under the porch. The door was built in three layers, with approximately 6″ vertical boards on the exterior and interior, and the same boards placed at an angle to form the hidden middle layer. Flanking the door are two pairs of casement windows, which are protected by solid wooden exterior shutters. A substantial masonry chimney rises through the gable on the east side of the building. The chimney measures 8′ at the base. The present chimney was reconstructed following the relocation of the building. Stones from the site were used to build the chimney. A second, smaller chimney on the west end (which was originally used to vent a wood stove) was removed in the course of the move. The interior of the building consists of a large one-room meeting hall which occupies the entire original portion of the building, and a hallway, restrooms and utility rooms in the shed addition. The interior is finished in peeled logs, which are part of the wall system. The logs retain their original appearance; they have not been painted or otherwise treated. The stone fireplace dominates the east end of the meeting room. The fireplace has its original mantle, which is edged in peeled logs. The room has a wooden ceiling. The roof framing and rafters, which are not visible, are formed by peeled wooden poles.